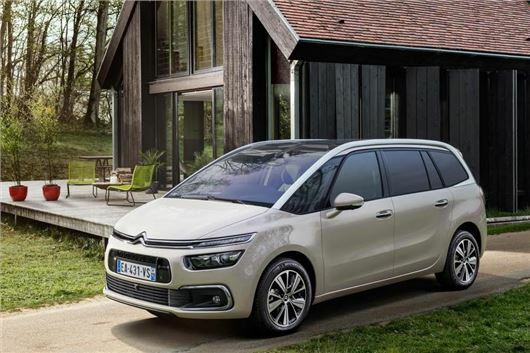 Citroen has annouced a number of updates for the C4 Picasso and Grand Picasso models. Order books for the revised MPVs open in June, and although the inevitable price increases are yet to be confirmed, expect them to be minor – starting at around £18,000 for the five-seat Picasso and about £20,000 for the seven-seat Grand Picasso. So what’s new? Not a great deal frankly, but the things that are aim to make the Picasso experience a little less challenging. Things like a hands-free tailgate, navigation that’s easier to use, and optional heated massage chairs. A couple of powertrain options make their debut as well. There is, of course, a front and rear redesign, as well as three new paintjobs and four distinct interior colour combos that Citroen calls "design themes". They’re basically blue, beige and grey, but Citroen has endowed them with a dash of additional metaphorical colour by suggesting they appeal to aspirational demographic groups: there are those with “active lifestyles” (the blue one), those who “place a premium on well-being” (beige), and those who like a “business class experience” (grey). The basics remain, meaning the Grand has seven-seats with the rearmost able to fold flat leaving 704 litres of boot space – almost twice you’d expect with a traditional family hatchback. The five-seat Picasso has 537-litres, or 630 litres if you’re willing to squash the kids’ legs by sliding the rear bench forward as far as it’ll go. A few driving aids come to the Picasso family for the first time, including a tiredness alert, lane departure warning, active cruise control (that’s able to bring the car to a complete stop if needs be), front collision alert and speed sign recognition. The two new powertrains are the availability of the PureTech 130PS three-cylinder petrol with an automatic for the first time, returning 55.4mpg combined and 115g/km. The other newcomer, also a petrol, has 110PS and is available only with the smaller Picasso and a manual gearbox.